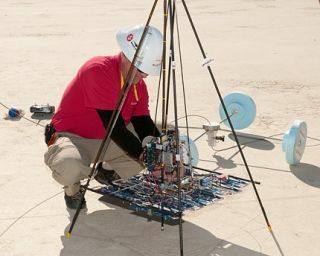 Dave Bashford of the LaserMotive team makes final adjustments to its robotic climber prior to one of its ascent attempts during the Space Elevator Power-Beaming Challenge Games at NASA Dryden in November, 2009. The team won $900,000 of the total $2 million prize. Thisstory was updated Friday at 9:50 p.m. EST. ASeattle-based team has won $900,000 in this year's Space Elevator Games, a NASA-sponsoredcontest to build machines powered by laser beams that can climb a cable in thesky. Thehomemade cable-climber built by the team LaserMotive of Washington state climbeda 3,000-foot (900-meter) tether suspended by a helicopter at a speed of about 8mph (13 kph) during a Wednesday attempt. The entry ultimately managed to climb the cable four times in two days, witha best time of about 3 minutes and 48 seconds. The featwas the bestperformance yet of a miniature space elevator prototype and qualifiedLaserMotive to win the second-level prize of NASA?s $2 million Power BeamingChallenge this week at the Dryden Flight Research Center at Edwards Air ForceBase in the California desert. The contest requires competitors to beam powerfrom a remote source to propel their vehicles up a 1/4-inch thick steel cabledangling from a helicopter. The 2009 SpaceElevator Games are the first in which prize money has been awarded and has"been a very successful competition," said NASA's CentennialChallenges director Andy Petro. "Power beaming is truly a 21st centurytechnology." DespiteLaserMotive?s success, it is still a long way away from what would be neededto carry humans to Earth orbit, as proponents envision. Spaceelevators were first popularized in the 1970s by the science fiction novelsof Arthur C. Clarke, as a means to reach space without using a rocket. Instead,a ship could climb along a fixed structure, like a beam or cable, suspended inspace by a permanent geostationary satellite 22,000 miles (35,000 km) aboveEarth. The sticking points are the need for a super-strong, yet light, materialfor the tether, and a good way to anchor the other end securely. Not to mentionthe vehicle to climb it. That'swhere the Space Elevator Games come in. Any team that can power their entrant for an averagespeed of 11 mph (18 kph) can qualify for a portion of the total $2 millionprize purse on offer. The competition is sponsored by the Spaceward Foundationand NASA's CentennialChallenges program aimed to spur development in space exploration. An attemptby the Kansas City Space Pirates on Wednesday fell short of the speed requirementand got stuck partway up the cable during a Friday climb attempt. A climber builtby the University of Saskatchewan Space Design Team was unable to competeduring the three-day contest because of a series of technical glitches, NASAofficials said. Had LaserMotive's entry managedto climb the entire length of the cable in under 3 minutes, it wouldhave won the entire $2 million prize. As it stands, the remaining $1.1 million in prize moneyremains available for future competitions, contest organizers said.